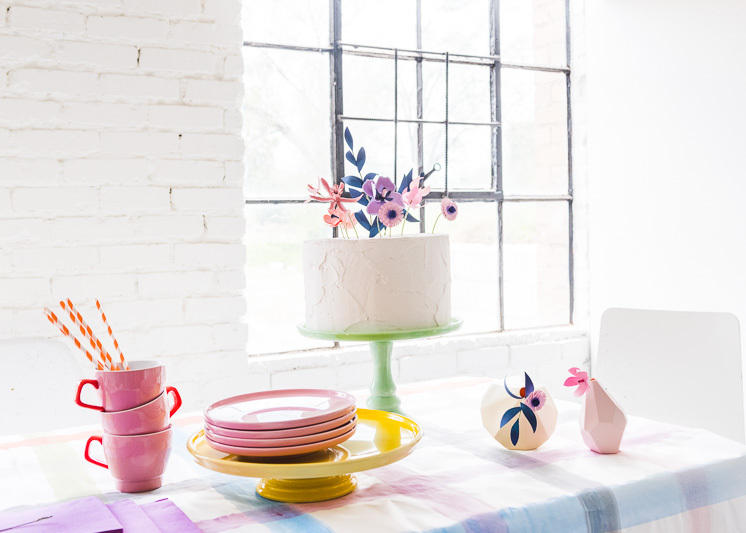 Tis’ the season for throwing a brightly colored brunch, summery soirees, lovely luncheons, and gorgeous garden parties. In regards to decor, we’re leaning towards the simpler route in this case. Let’s face it, if you have to worry about pricy and time-consuming tablescapes, it’s never going to happen. Anyone relate? 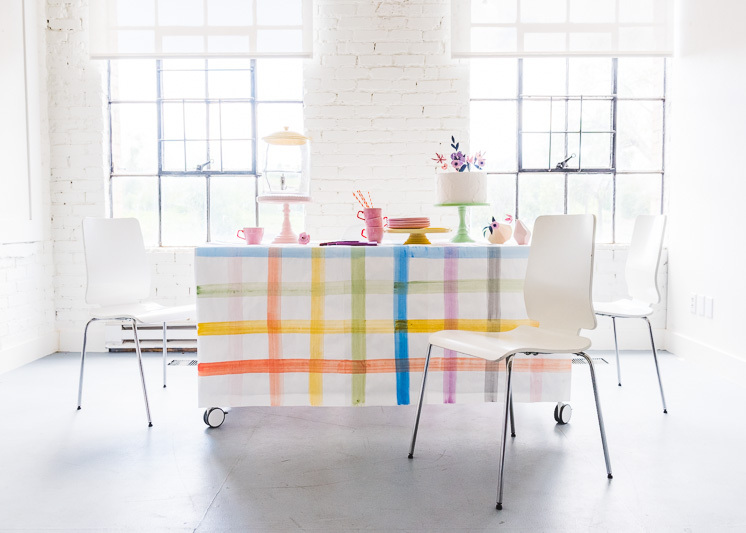 We created this Painted Plaid Paper Tablecloth because it’s brightly colored and perfect for spring and summer. Not to mention easy, cheap, and disposable. Please and thank you. 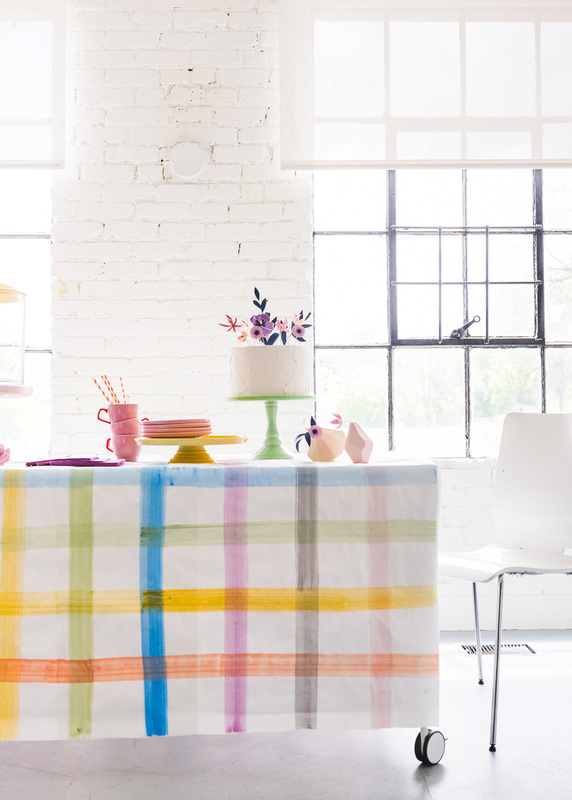 To create this all you’ll need is white butcher paper and some acrylic paints from the craft store. So don’t be discouraged to throw a few gatherings in the next couple months! 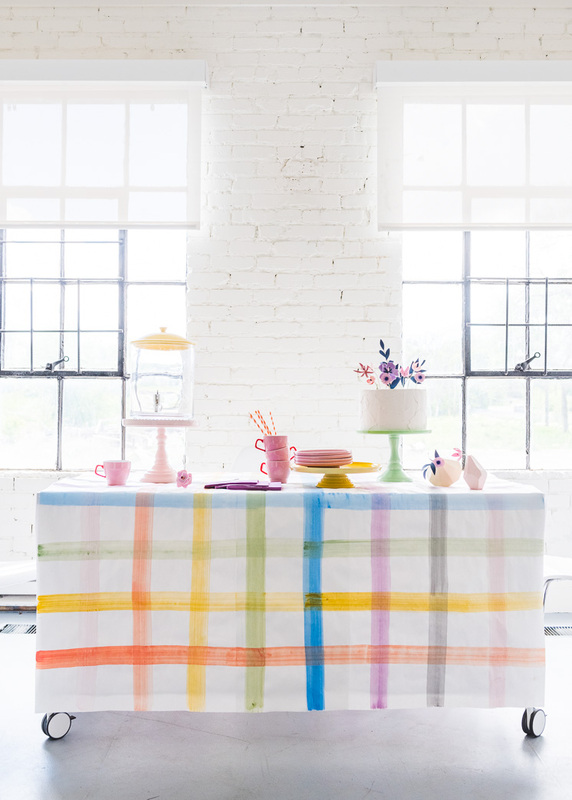 This Painted Plaid Paper Tablecloth is the perfect addition. 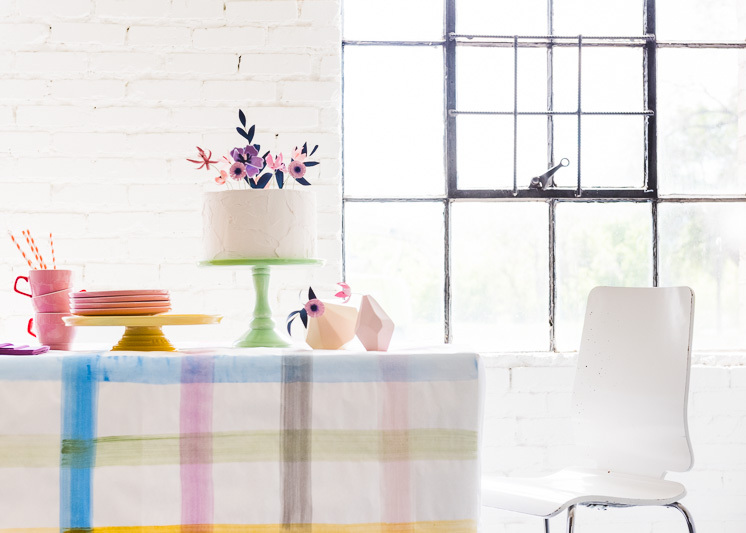 Learn how to paint your own plaid tablecloth! White Butcher Paper: enough to cover the width of the table. We used 2 pieces and overlapped them. Acrylic paint in 7 colors. 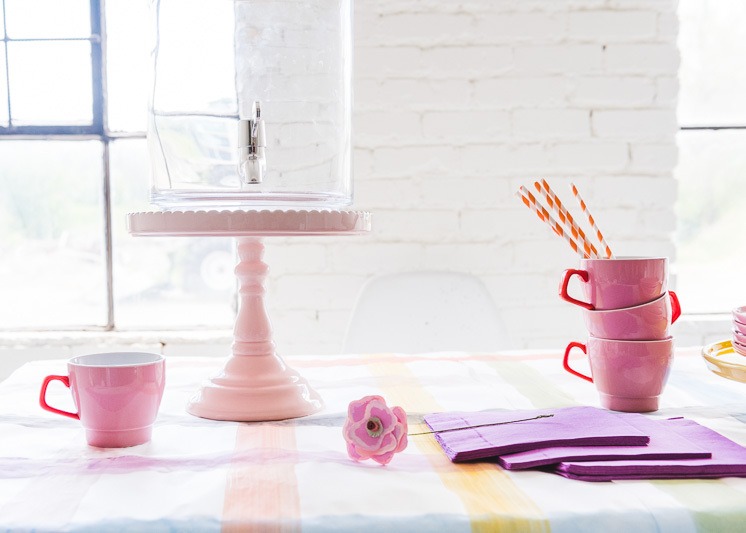 We used blush pink, coral, mustard yellow, chartreuse, sky blue, lavender, and grey. 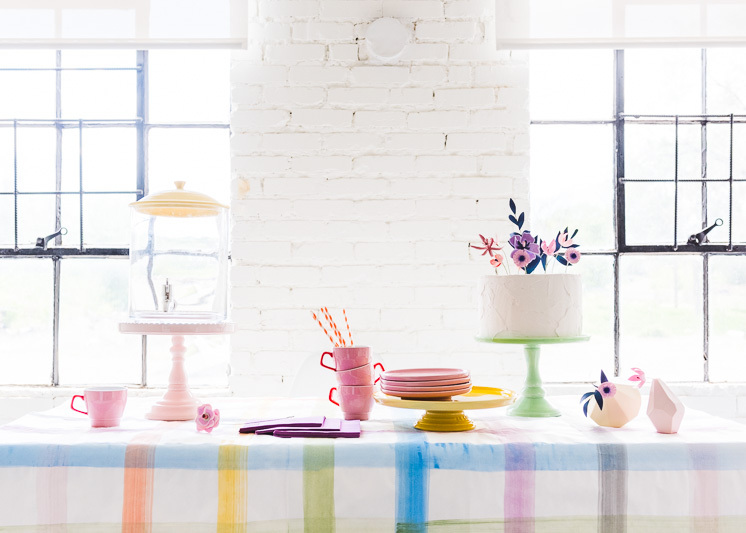 If you needed multiple pieces of Butcher paper to cover your table, slightly overlap them and use double-sided tape to connect them. 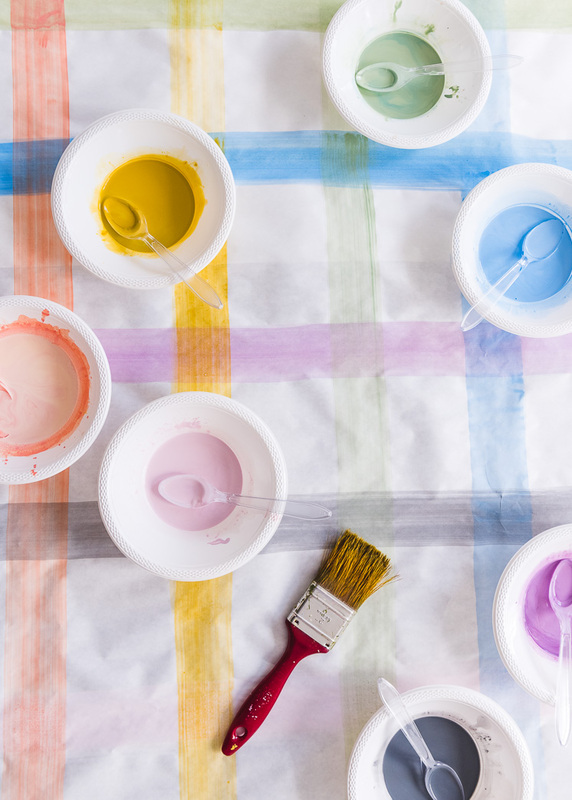 Squeeze about 1-2 tablespoons of paint into each bowl. Then dilute the paint with 2-3 tablespoons water. Mix well. This will give it a slight watercolor effect and lighten the colors a bit. Start with the verticle stripes and paint on one color at a time. We followed a rainbow color pattern. Pink, coral, mustard, chartreuse, blue, lavender, grey, and repeat. We wanted the look to be painterly and imperfect so we didn’t measure the stripes but they are roughly 4-5 inches apart. Once you’ve complete the verticle stripes, paint on the horizontal stripes, following the same rainbow pattern and again about 4-5 inches apart. Let dry. The paint will buckle the paper a bit but that’s okay! We placed our paper tablecloth over a white cotton tablecloth to make it more opaque and disguise the slight overlap of the paper.